Texas Congressman Ron Paul has hinted that he is strongly considering another Presidential run in 2012. Paul, who previously ran for the Republican nomination in 2008 and under the Libertarian Party in 1988, told an interviewer that “It’s something I think about every single day,”. The Congressman’s comments came during an interview with his former House colleague, Bob Bauman, legal counsel for The Sovereign Society – an independent investment advisory group. Paul said it would “be a tough decision”, but that he believes the American people are ready to embrace a new political direction. The comments have not been picked by by mainstream media sources as of yet. The Congressman has previously downplayed rumours of another Presidential campaign, saying it is unlikely. However, following a string of successes in recent surveys and straw polls, including victory in the Conservative Political Action Conference’s (CPAC) presidential straw poll, it seems Paul is now reconsidering his earlier statements. The full Sovereign Society interview with Ron Paul can be heard here (registration required). At the height of Paul’s 2008 campaign, dubbed the Ron Paul Revolution by supporters, the Congressman smashed the all-time record for political donations on one day, beating John Kerry’s previous effort as he hauled in over $6 million dollars during a 24-hour period that coincided with the 234th anniversary of the Boston Tea Party. Indeed, as we have continuously highlighted, The Tea Party movement, originally Libertarian in origin, grew out of this trend of honouring the anniversary of the Boston Tea Party. An event held in 2006 was repeated in 2007 with the Ron Paul Money bomb, and the movement evolved from there over the following three years. As part of an effort to encourage Ron Paul to run for president in 2012, a Tea Party moneybomb has been set up with the aim of repeating those previous successes. The goal of The Ron Paul Tea Party is to have 100,000 people donate $100 each on December 16, 2010 to kick off Paul’s 2012 presidential bid, should he decide to run. 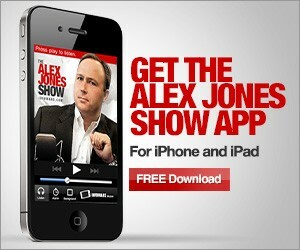 Infowars’ Alex Jones has personally pledged support to the Draft Ron Paul movement, noting that Paul is the only candidate who will inject real issues into an otherwise sterile debate format and that everything he has been warning the American people about for decades is coming into fruition as we approach 2012. Whether neocon and corporate Republicans like it or not, Ron Paul has had and continues to have a far reaching impact upon the direction of the party. Every rare intelligible thing that Sarah Palin has said regarding limited government, fiscal economic policy and the restoration of freedom is taken straight from the Ron Paul handbook. The core difference between Paul and Palin is that the Congressman has built a real grass roots following over the course of several decades. Paul is the real deal, while Palin, Romney, McCain and Gingrich, on the other hand are all neocons at the core, supporting the invasion and occupation of sovereign nations in step with the grossly bloated empire building military industrial complex. Never pandering to the crowds, Paul has consistently hammered home this key difference. Of the current crop of possible 2012 GOP presidential candidates, Ron Paul is once again the only one truly in step with the majority anti-war, anti-big government sentiment in America. The Texas Congressman has also been instrumental in leading a grass roots revolt against the real culprits behind the economic collapse, the Federal Reserve, introducing a bill to audit the private organization which has received widespread support from both Republicans and Democrats but has been fought at every turn by elitists in Washington. If you thought the impact of the Ron Paul Revolution in 2007 and 2008 was damaging to the new world order agenda, then imagine what kind of momentum could be built up over the next few years as we head towards 2012, which globalists have marked down as a key juncture by which they want their global feudalist system firmly in place. It almost seems like fate that the Congressman should lead the mass resistance to the globalist agenda at this crucial time in history, and we implore him to take on that hefty responsibility while guaranteeing that the grass roots will rally behind him with a ferocity never before seen in recent political times.